First, a disclaimer: In the offseason — where hitting is banned and helmets aren’t on half the time — on-field work is suited for certain groups to stand out. Usually offense has the edge overall, since there is no tackling even in minicamp and no one needs to be afraid of getting leveled coming over the middle. So that immediately emphasizes the wide receivers. Sometimes, summer goodness translates to the season (Steve Breaston). Sometimes, not so much (Steve Williams). That said, and knowing they’ve only been on the field a few days, the Cardinals are happy with what they’ve seen from drafted wideouts John Brown and Walter Powell. They should be, from what I have watched. Brown especially looks every bit of the 4.34 40 guy, and more importantly, he looks confident in what he is doing. He shown good hands — snaring one Logan Thomas laser I happened to notice — along with his quickness and explosion. Powell too has shown similar things. Again, when you are talking about players from Pittsburg State and Murray State, you don’t want them overwhelmed by the stage. Now, there is a long way to go. The real stage comes later — in training camp, in preseason games, and then in games that count. There are plenty of potential pitfalls. The scene will even change next week, when helmets go on and the defense is introduced to the passing drills. Each step will be important. Brown is a kid you want to root for, given his backstory. But succeeding in the NFL isn’t about the what you’ve done to get this point but what happens now that you are here. The start, however, provides hope. It was toward the wrong end zone, and it was the Cardinals’ defense instead of its offense, but it was difficult not to look at Tyrann Mathieu racing down the middle of the Edward Jones turf Sunday behind a breakaway Ram and not think of Steve Breaston. In 2010, Breaston, the wide receiver, had a wasn’t-gonna-give-up play after a Cardinal turnover, and a sure Rams TD was undercut when Breaston knocked the ball loose and into the end zone, where the Cardinals recovered. This time, it was Mathieu, flying up behind Rams tight end Jared Cook and improbably popping it loose – into the end zone, where linebacker Karlos Dansby jumped on it. Honey Badger – remember, he’s good with it again – said he was just always going to try and make a game-changing play, and that could have been it. Perhaps should have been. The Cards save seven points there and when they took the 11-point lead into the fourth quarter, you were thinking that should have been enough. That wasn’t the only déjà vu I had Sunday though. Watching running back Andre Ellington run that key third-down wheel route – and see him get wide open beyond the linebacker – reminded me so much of the one LaRod Stephens-Howling ran in Philadelphia in 2011 on a key third down during the Cardinals’ game-winning drive that game. Ellington was in position to do the same – except the pass never really had a chance. The Cards won the Breaston game. The Cards won that Hyphen game. They couldn’t win Sunday. — We’ve had this discussion before, about Levi Brown. I’m guessing this won’t be the last time. He didn’t play well enough against the Rams. Got a holding call and was beaten three times by Robert Quinn for sacks. And then, after the game, Bruce Arians first said – before he even got a question – that he wasn’t worried about his offensive line. Then, asked about Brown specifically, said Brown was his guy and made the point there was no one better to replace him with. I know everyone says it should be Nate Potter, but Arians gave Potter a lot of opportunity in the preseason and Potter did not seize the moment (in fact, struggled at times like Brown did, mostly against guys deeper on the depth chart.) The way Arians talked Sunday, he feels strongly there is no one on the roster for which to bench Brown. Steve Keim is always looking for upgrades, but I’m not sure you’re going to find a left tackle on the street. The Cards would have loved for one of those tackles to fall to seven in the draft, but it didn’t happen. They took Jon Cooper, and yes, I am sure left tackle will be a point of emphasis next offseason. — Carson Palmer looked like he had plenty left to me. — Andre Roberts had the stuffing beaten out of him, and he held the ball every time. It may have been Roberts’ best game as a pro. — The Cardinals missed Daryl Washington. It’s obvious to say a team misses a Pro Bowl player, but he would have been able to make an impact. Maybe been a better matchup for Rams tight end Jared Cook. — Speaking of linebackers, Arians said John Abraham was fine. He didn’t play a ton though. — With 26 seconds left and the ball on their own 20 in the first half, it would have been easy for Bruce Arians to sit on the ball. But the man who says “No risk it, no biscuit” risked it, and Carson Palmer, after a completion, hit three straight long passes to set up a 50-yard field goal. Unfortunately, Jay Feely pushed it a bit wide right, painful in a three-point loss. — Javier Arenas didn’t play defense, but the veteran cornerback was in there to return kickoffs. It didn’t go well. One time he fielded the ball deep in the end zone and was stuffed short of the 10-yard line. Another time, a return from deep ended up being fumbled, although the Cards fell on it. — We’ll see how the Cards adjust this week. And we’ll see if the Cards make any roster moves too. The fact Bruce Arians mentioned undrafted rookie receiver Jaron Brown the other day (and Charles Hawkins, for that matter) may in the end mean nothing. Impressing in June is not the same thing as impressing in August, when, as Arians has brought up time and time again, the lights go on and players can change. But it was tough not to notice that Brown got a lot of work in multi-receiver sets, especially late in the offseason work when Michael Floyd was protecting a testy hamstring. With Ryan Swope absent with his head issues, the door is open for some unknown receivers to make a push for a roster spot. The Cardinals have had a recent history of finding some receivers from nowhere this time of year. This was the time when Steve Breaston first turned some heads in 2008, and while Breaston was a fifth-round draft pick in his second season, he was never thought of as a guy with that potential before that summer. There was Stephen Williams in 2010. And Byrd last year. This time, it was No. 13 — Brown — who seemed to be everywhere. Brown isn’t the only young candidate. Arians mentioned Hawkins and Robert Gill (who as an arena veteran isn’t exactly a rookie, but falls into the same kind of category) as guys who have stood out. Those guys have some speed, which is a component Arians seeks in the receiving corps. Brown, by the way, ran a 4.4 himself at his pro day, so he’s not exactly slow. The caveat that always comes with the receivers who flash in the offseason? It’s easy to flash in shorts, knowing you won’t get hit going over the middle. Brown has made a good impression. So far. Sometimes, it takes intense evaluation to know where you are as a team. Sometimes, it’s a little more simple. Again, and this has been said too many times to count, the Cardinals as constructed don’t have margin for error. Their defense is good, but not so suffocatingly good it can hold off the opposition every time. The offense can’t turn it over and must carve out more points when it has a chance, because there won’t be too many — if any — 30-point outbursts. Special teams has to contribute to aid both sides. The Cards have to have something more to be in the game. — Because I know some people still might be interested, word out of Philadelphia is that the future of cornerback Dominique Rodgers-Cromartie is uncertain with his contract set to expire. — Another former Card, Chiefs wide receiver Steve Breaston, was a surprise healthy scratch on Monday night. This time of year, everyone is always asking me, among other things, what player do I think is going to break out during whatever season is approaching. There’s always the matter of defining just who can be a breakout candidate. To me, it’s a guy who has only been in the league a short time. Usually it’s a guy who just completed his rookie season, although it could be a player who has been around a bit longer. There was a point early on when Adrian Wilson was my pick a couple of seasons in a row. Alan Branch was a popular choice. This year, it’s tough to get away from a couple of potentials: tight end Rob Housler and running back Ryan Williams. Williams, of course, has to prove himself healthy. Housler has to battle a lot of guys at tight end to make sure he gets playing time. But others are intriguing. Sure, Patrick Peterson is a Pro Bowl punt returner, but he still has to prove a lot at cornerback — and having him take a big step forward there is certainly possible this year. The Cards wouldn’t mind if either Dan Williams or David Carter really established themselves at nose tackle. It’s not always simple, though, not like Steve Breaston going from eight catches in 2007 to a 1,000-yard receiver in 2008. Still, this is the time of year when you mull such possibilities. P.S. I will be doing a pre-camp live chat tomorrow — Tuesday — at 11 a.m. Arizona time (that’s 2 p.m. in the East) right here. We can talk breakout guys or whatever you might want. We’re only a week away. This time last year, then-rookie wide receiver Andre Roberts, a third-round pick, was struggling. Mightily. The coaches preached patience. And by the latter part of the season, Roberts looked like he finally “got it.” All the feeling he would end up a bust looked, in hindsight, ridiculous, and he became a prime example of evaluating prematurely. Ah, the No. 2 receiver spot. It was Steve Breaston’s most of last season, but by the end of the year, the coaches were using him in Breaston’s spot, testing him out and liking what they saw. They certainly like what they are seeing thus far in Flagstaff. Roberts looks nothing like the guy who dropped too many passes 12 months ago. He not only is catching the ball, but making receptions in traffic, the kind that Larry Fitzgerald makes routine. Roberts even sounds more confident. A nice guy, he’s to the point where he doesn’t look like he’s all that excited to continually revisit his rookie camp troubles. He’s past it, and so too are the men coaching him. Roberts’ emergence is the piece too often missing when anyone is discussing the Cardinals’ depth chart at the position and the chase for free agents. (New tight end Todd Heap, who will make his share of catches, seems forgotten in that mold too). Coach Ken Whisenhunt has said many times the Cards will continue to monitor who is out there when it comes to the entire free-agent market, and they aren’t going to close the door on anything. But the Cards were serious when they said Fitzgerald’s extension was now their top contractual priority. That wasn’t just because Fitz is an important deal, but also because they are comfortable with their wide receiving corps. That’s in large part because of Roberts, who has proven to coaches he is a different player than he was as a rookie. Wide receiver Steve Breaston hasn’t agreed to a contract anywhere else yet, but a non-Cardinal source confirms Breaston won’t be coming back to the Cardinals. It’s not a shock, given the way the season closed out for Breaston and how the team was looking closely at Andre Roberts. Roberts will be the leading candidate to replace Breaston and be Larry Fitzgerald’s No. 2. I have no doubt Breaston would have stayed, but it became clear that his worth elsewhere on a new contract was going to exceed what the Cardinals would be thinking. Heading into his fifth NFL season, this could be Breaston’s biggest deal, and he needed to take advantage of what was/will be presented to him. For the Cardinals, I could see them looking at a mid-range veteran in free agency, although the hope is still that Roberts and Early Doucet fulfill their promise. As for Breaston, he went from a fifth-round return man who then-OC Todd Haley never thought had a prayer to become a viable NFL receiver (the irony that Haley and the Chiefs are rumored to be in the thick of the Breaston/free-agent race) to a 1,000-yard receiver in 2008 on the last offensive play of the regular season against the Seahawks. He scored a key punt return touchdown against his hometown Steelers in 2007, made that amazing forced fumble in St. Louis last year, and was a member of the always-interesting “Backpack Boys” in the locker room. Oh, and he was one of the patient team spokesmen last season after every loss, even as the frustration mounted. Personally, he’s a guy I would have liked to stick around (and until he signs another deal elsewhere, I guess the hope remains). But if this offseason hasn’t driven home the point enough, business is business, and that includes the NFL. Breaston said the knee that hampered him all season is fine now, but he also didn’t want to talk about it much, saying it meant nothing for him to say he was OK — only that he needed to prove it on the field. Of course, he’ll have to sign somewhere before he can really show that. He’s been working out with teammates like Adrian Wilson and said he is stronger in his legs, and admitted last year was inconsistent, in part because of the knee. He didn’t have any further surgery, but the rest made a big difference. 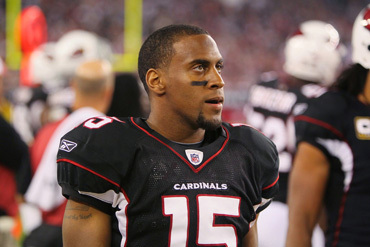 Breaston is one of the many potential free agents who will soon flood the market once the labor situation is settled. His chances of returning to the Cards may be based on his market value, and what other teams may offer. So, whenever this is over — and again, it seems closer to that than it has been, right? — to say the NFL and those of us in it will be on a fast track is possibly a monumental understatement. There are stories about potential timelines, etc., etc., but what actually happens, both with a timeline and the actual rules in place, is very much still up in the air. Regardless, as we get to the middle of July, there are hundreds of contracts to work out, for both existing players with expiring deals and undrafted rookies and the drafted rookies (That first month or so is gonna be a grind-and-a-half for Rod Graves and Justin Casey). The Cards, like every team, have prepped for free agency long ago. They have worked out potential FA targets regarding whatever the FA rules will be. They also know which players they want to push to bring back too (no, I do not have access to that list). It’s going to be even more work than normal too, since many reports say the teams will have 90 on the roster instead of 80 for camp, a little more leeway for injuries and such in this uncertain season. You have to figure resolving the QB situation will be at the top of the to-do list, but then which way does it go? 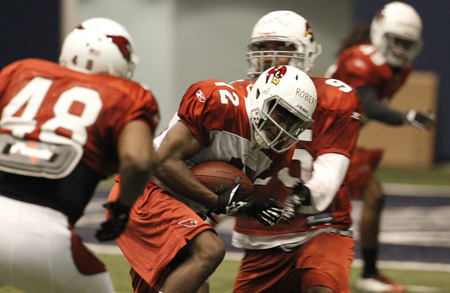 Are the Cards able to keep guys like Sendlein, Breaston and Lutui? How many undrafted free agents are going to be targeted? More important, which veteran free agents will the team chase? And where does Larry Fitzgerald’s extension fit in? Certainly, there will be daily news flowing quickly, so there will be plenty of which to write. Now it’s about waiting to see exactly what the headlines will be, and how fast they get pushed aside for the newest development.